As of 20:55 PM Mountain Standard Time on Dec. 2, 2007, this request has been fulfilled. VGMaps.com now hosts all of the maps that you can see in the NES Game Atlas (the first official Nintendo Power Player's Guide), as well as the maps from the other games in the covered series. Thanks to everyone who contributed! Hey, I know I'm asking for a lot here, but here goes. 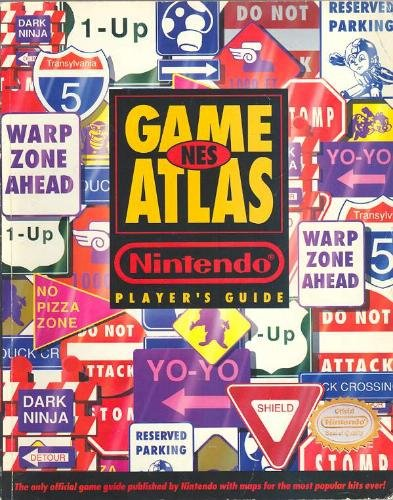 I'm sure I've mentioned this on numerous occasions but I love the very first Nintendo Power Player's Guide, the NES Game Atlas. This book had 18 NES games from 8 different series mapped out, and was probably what stirred the realization in me that game maps can be fun to look at. I would eventually like these games mapped out - though I know it would be quite a lot of work. I think many of the games have been fully mapped already, but I'll list them here with links for convenience's sake. I will also list the sequels that were not included in the original book (since it was released in 1991/1992) with a "+", which, if you include Super Mario Bros.: The Lost Levels and the other Disney/Capcom NES games, nearly doubles it to 33. Sega Visions used to do maps too in the early days. I'm not sure how the NES ones were done, but they merely took screenshots and pasted them together (you can see the counters and sprites in each "frame"). They originally had a handful from Kid Chameleon in one of the issues, but I think I've got the beat with over three quarters of the game mapped. I'd offer to do some of these, but I know you have a lot more people willing to do (S)NES maps than Genesis, so I think I'll continue to work on Genesis games. Sometimes, smaller projects can be fun since they're less difficult to do (less hassle with sprites, parallax backgrounds, transparencies, etc). Incidently, I used to own Duck Tales for my NES back in the days. It might be fun to go and fully map it, but that's not happening for a while at least. I've already drawn up Ducktales maps for the NES and Gameboy seen on GameFAQs. And I'd like to ask, why would you think my Zelda 2 maps are in consistant? ReyVGM has an overworld map made from graphics ripped from the game, and you have hand-drawn maps for the dungeons. There's nothing wrong with your hand-drawn maps by themselves, StarFighters76, nothing at all, but I'd like for all the maps to be the same (ripped or captured or original, but just only one of those formats) and seeing as how these are all for the NES, "ripped" is very much the preferred format. As I said, the goal is a recreation of the NES Atlas, but the best way to one-up their photographed maps is to have ripped maps. Rick Bruns has sent in a couple ripped maps from Zelda II (so I'll change its status from INCONSISTENT to INCOMPLETE), and thanks to Grizzly, we now have all of Adventures In The Magic Kingdom (minus the 3D Space Mountain stage, but that can't be helped). I spent a good deal of today compressing several NES maps with PNGGauntlet using brute force compression. I found last night that most of the Mega Man games' maps shrank to about 45%-55% of their original size, though one compressed to only 86% but a few shrank to about 25%-35%! So today, aside from a few random ones that I KNEW didn't have 16.7 million colours, (most NES maps should have less than 256 colours, several of them even have 16 or less,) I made sure to also compress everything that we currently have for the NES Atlas recreation. If I can shrink all the popular maps down to half their filesize, I may be able to take a big chunk out of my bandwidth usage! Plus, they'll load faster, too. Just curious, about how much bandwidth do you use per month? That's off-topic, but I can't answer the question accurately for a couple reasons. The past couple months, as you may have noticed, the site went overbandwidth and became unviewable right near the end, at over 50 GB. Now this would be a good indicator of how much I used (since it maxed out at the end) except for the fact that for some reason the hotlinking protection was disabled (I don't know if Inty did that, or if I did that for some reason and forgot to reenable it, or something else entirely). I know leeches hurt my bandwidth in the past, but I don't know by how much. Now that hotlinking protection's back on, my bandwidth won't be killed by someone posting a direct image link to a big map on a popular forum, for example. I just finished compressing all the NES maps. I've saved 32.5 MB from the compression I have done so far (52.8 MB instead of 85.3 MB, a reduction of 38.1%), so with both hotlinking protection and a possible overall size reduction of about 40%, I may see significantly reduced bandwidth usage in the coming months. I see that my Willow maps sizes have been (about) halved. Quite amazing. And congratulations to TerraEsperZ for being the first to reach the "22: Experienced User" level. Do anybody know where I can find a list of these user levels? heh, i have both zeldas on my site, if someone wants to take them and remove the stamps and whatnot ill let you host them. I have all of the first SMB mapped as well. If you want these maps just say so and i perhaps may can find a free moment to strip them of the VGM stamps and whatnot, but definitely not my tips! just gimme the go ahead i guess.